It is clear that traffic signals were developed to allow a smooth flow of traffic on junctions or in areas with too much traffic (traffic flow/coordination), as well as to provide a safe passage for weaker groups (traffic safety). But should everyone really be required to adhere to these regulations? The problem of too much traffic has, for example, already developed in ancient Rome, where Julius Caeser finally decreed that only public officials were allowed to drive through certain parts of Rome. Since this is a measure that is difficult to impose these days (in any case public officials have already enough exemptions nowadays…), traffic lights were developed. Directing the traffic flow did allow a much smoother run of traffic. 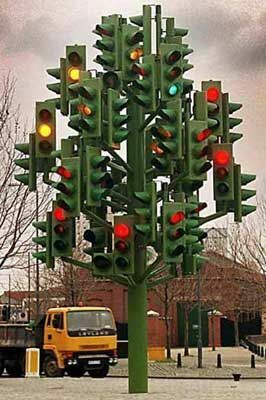 So while directing a heavy flow of traffic and making crossing streets safer is certainly the most important aspect of traffic signals, there are situations where traffic signals get more and more questioned. For example, if a pedestrian stands at an empty crossing at 3am in the morning, with no cars or other traffic participants in sight, should that pedestrian have to wait for 3 minutes until his light turns green? In Germany, if a bicyclist runs a red light, this yields a fine of 120 euros and a point on the driver’s license. Thus, some perceive that there has been an over-regulation of traffic. So is this a reasonable point? Or what precisely is the point? A recent article forwards 11 reasons why pedestrians and bicyclists (PaB) should not need to adhere to the traffic light. I summarize them as follows: 1) PaB take more care than car drivers because they are more vulnerable and slower; 2) traffic lights make PaB slower and less attractive; 3) stopping at traffic lights makes PaB breath in the car emissions. In addition to that Sabine Leidig proposed 4) reduction in CO2 emissions. So let us make sense of these arguments. As a first disclaimer we have to say that obviously this liberalization of traffic rules will not be possible at heavy load junctions since it is clearly too dangerous. Thus, this deregulation should only apply in case of smaller crossings or outside of rush hours or periods of busy traffic. Clearly, point 4, the reduction in CO2 emissions, only comes about if the more liberalized traffic rules for PaB lead to fewer car drivers and more PaB. Is that a reasonable point? Would anyone really believe that being allowed to run red lights as a PaB makes someone switch from taking the car to being a PaB? Seriously? Car drivers use the car if it is the simplest, most flexible and fastest means of transport. Thus, given that the deregulation for PaB would only be effective outside of rush hours, it seems pretty unreasonable to believe that there will be a significant reduction in CO2 emissions. In addition, at most junctions (e.g. in Germany) there are already Vehicle Detection Loops in place, which means that at empty junctions cars will receive a green light when approaching. Hence, time saving will be very little, and thus this will not induce many car drivers to shift towards PaB. I think the point of emission savings is pretty weak. The previous points that I raised certainly also address point 2). Point 1) is about safety. Since PaB take more care than cars then they will be harmed less and harm less themselves and thus they should not need to adhere to traffic lights. This is of course a dangerous path to tread on. Even if one agrees that PaB are more careful, adhering to red lights saves PaB from being hit by less attentive car drivers. Traffic lights are there to stop the streets from succumbing to the rule of the strongest, and thus they should be seen as giving rights to the weaker participants. Thus, they improve the safety of PaBs. Final point is number 3), namely that not needing to stop at red lights improves PaBs health. Again, since these deregulations can only really be applied outside of rush hours, there is not going to be a significant health improvement. In summary, I think that, overall, the arguments around liberalization are pretty weak. First, we should remember that these deregulations can only apply to times that are less busy, outside of rush hours, or junctions that are anyway not busy. In this case, the arguments that apply to PaB will also apply to cars. Why make cars wait during the middle of the night if noone is around? If one wants to have a smooth flow of traffic even during those times, then the answer is clear: Outside of rush hours, or on less busy junction, just scrap the traffic lights altogether! Why try to direct the flow of traffic if there is very little traffic, i.e. if the reason for directing traffic, meaning traffic jams due to traffic congestion, is absent? I guess this is the main question to be answered. And there are already significant steps in this direction. For example, roundabouts have been constructed at many junctions, allowing a smoother flow of traffic. In addition, Vehicle Detection Loops have been put in place during less busy times so that approaching cars immediately get green lights. Thus, in light (… :-)…) of these means of improving the flow of traffic in general it seems absolutely unneccessary to provide special exemptions for PaBs. However, if one still wants to make PaBs travelling smoother, then it may still be useful to simply provide PaB crossings at many places so that PaBs can more freely cross streets without needing to necessarily cycle or walk to the next junction.